Planning to use WordPress to build your website and further your brand or boost foot traffic to your business? Great choice! WordPress is one of the most popular Content Management Systems (CMS) around, powering around 30% of all websites on the internet. But what about your web hosting site? Choosing the most suitable one for your needs can be almost as important as your website itself. In 2004, a group of university students put their heads together to come up with a new hosting site that, today, boasts well over 1,700,000 domains worldwide. In the time since its inception, Siteground has developed quite a reputation for its service, particularly when it comes to another site: WordPress. Together, SiteGround makes CMS and website hosting a cinch for WordPress users – even if they aren’t pros. For a website to be searchable on the web, it will need to be posted online by web hosting company. Reliable web hosting is a critical part of creating and maintaining any website, as it can help reduce any guesswork related to where all your relevant information is stored. Even if you’re not sure what to do with this information, choosing a good web hosting site is a good start to building a website. For website owners who have a WordPress site, there is no shortage of options from which to chose. With hundreds of thousands of hosting sites out there, it can be overwhelming to navigate all the possibilities and discern what is best for you. Thankfully – we can help! SiteGround, as we mentioned, is rapidly becoming one of the best web hosting companies for WordPress, thanks to its ease of use. More specifically, Siteground has specially engineered their hosting to offer WordPress websites the best load times, auto-updates to keep the most advanced plug-ins up-to-date, and dedicated support for all WordPress issues. 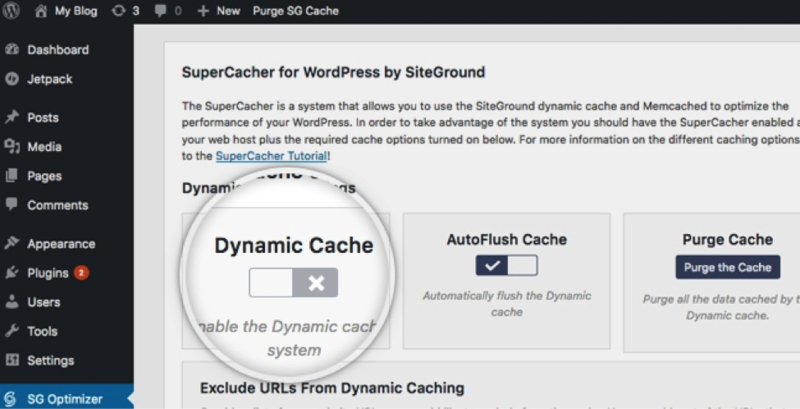 With options like SuperCacher, for example, WordPress websites hosted by SiteGround can deliver fast load times to users with three layers of (very complicated) caching. The first layer, Static Cache, is the most basic level comes free with a standard web hosting package. Basically, a copy of your static content is saved to the server’s RAM rather than its hard drive, which allows for faster loading when a user pulls up your website. The second layer is Memcached, which is widely used by thousands of popular databased-driven sites, like YouTube, Facebook, and more. It works by caching various results from these databased onto RAM, so when the same query is needed it instantly loads, rather than having to pull from the database every time. Currently, SiteGround is the only shared hosting server that offers Memcached. Finally, Dynamic Cache is an incredibly complicated system that manages to create a cache of not just static images or a query result, but the entire page. The process works by converting caching a PHP the first time it is converted to HTML and storing it in the server’s RAM, so the next time it tries to load up, it takes half the time. Basically, a SiteGround-integrated WordPress site will simultaneously pull up a cached version of your site while the live site is working, to not compromise on load times! Want to take advantage of the second and third layer of the Super Cacher? Upgrade to a GrowBig or GoGeek hosting plan! SiteGround also offers incredible uptime ratios – nearly 100% across the board! With handcrafted solutions, tailored to meet different needs for different sites, SiteGround can all but guarantee that your site will never go down thanks to Linux Containers, pro-active server monitoring, AI technology specially designed to fit bots, and a myriad of powerful processing tools. The SiteGround pros take their responsibilities to WordPress users seriously! Not only are team members often active in Word Camps – aka WordPress conferences – they are well known for their helpful support. Plus, with endorsements from big names in SEO, like Yoast CEO Joost De Valk, it’s no wonder that users view SiteGround as a reliable source for more than just website hosting. Want to keep all your scripts updated with just one click? SiteGround has the capability to do that! With the auto-update tool, WordPress users don’t have to complicate their lives trying to figure out what they need to upgrade next. Or, if you’d rather be in charge of when updates happen, you have the power to customize the settings. Better yet – if you find you made a change you can’t figure out how to revert, or you lose your information, or worse – your site crashes – SiteGround automatically backs up your site daily! Want to make the change but are already hosting with another website? Not a problem! SiteGround offers a free website transfer service so those who are less tech-savvy can feel confident making the change over to WordPress. 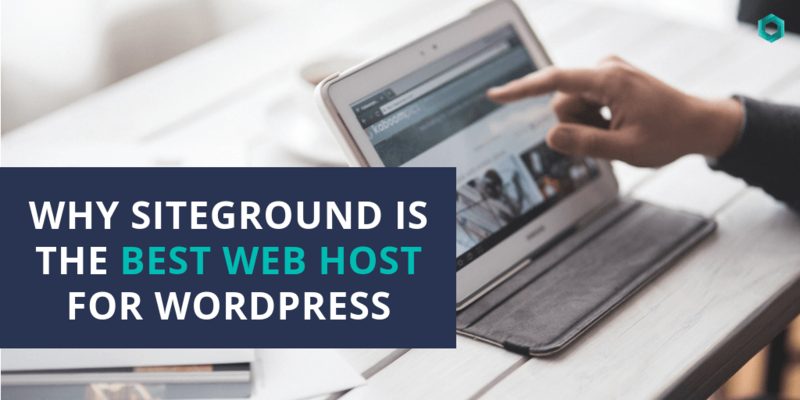 SiteGround isn’t just limited to WordPress website hosting. If your business plans to send out regular e-blasts, newsletters, or develop an online shop, SiteGround can help you set everything up. There are even cloud hosting options so you can safely store any documents, pictures, or resources in an easily accessible place! If you are planning to collect information of any kind on your website, you will need an SSL certificate. Thankfully, SiteGround includes free “Let’s Encrypt SSL” technology for all users with their basic plan. This option is ideal if you are a small the only data you plan to collect is minor, like emails or phone numbers. However, if you are dealing with more sensitive information, like credit card or social security numbers, SiteGround offers more secure options: Wildcard and EV SSL. Wildcard is recommended for medium-sized business while EV – or premium – SSL provides a warranty of up to $1.5 million. SiteGround makes it easy to upgrade, and your clients will appreciate the added layers of security. What’s even better is SiteGrounds offers all of this for reasonable, affordable price tags! For new customers, SiteGround offers three price points, beginning at just under $3.95/mo, that is only $47.40 for an entire year! For small business owners who need only the bare minimum, this can be a perfect starting point that won’t break the bank. For those who plan to host multiple sites with upwards of 100,000 site views monthly, the special pricing is just under $12/mo. Even at full price the middle tier – which delivers the perfect option for anyone who plans to have more than one site but not heavy bouts of traffic monthly – is almost $20/mo. (with special pricing starting at just under $6/mo.). Start with the right design, employ rich features, and then incorporate eye-catching content, and you have all the starter tools for a strong website. All you are missing is the right hosting partner. We recommend using SiteGround whenever developing a WordPress site to ensure that you get started with the best hosting site the get-go, and reduce the complications of website management. Leave us a comment below if you have any questions regarding SiteGround or web design/development.